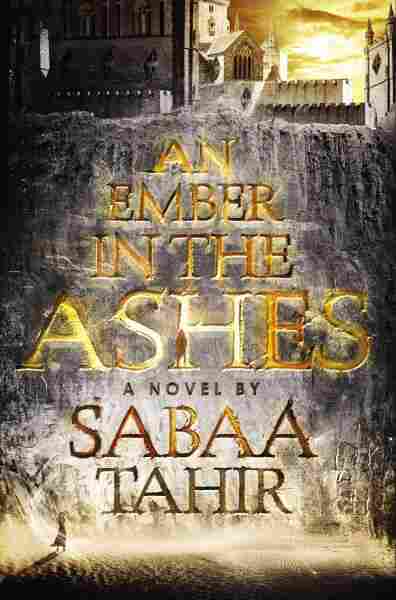 Rome's Might Meets The Arabian Nights In 'Ember In The Ashes' First-time novelist Sabaa Tahir creates Capital Letter Fantasy in An Ember in the Ashes, with rebel Scholars battling an ancient, brutal Empire. Critic Amal El-Mohtar calls it "frequently riveting." In An Ember in the Ashes, Sabaa Tahir brings us a world at a crossroad of reminiscences: The Roman Empire on the one hand and A Thousand and One Nights on the other. Mixing magic and military intrigues in shifting proportions, the result is an appealing fantasy of crossing destinies and impossible choices. The Martial Empire has been a dominant power for 500 years, having subjugated an ethnic group called the Scholars, partly through the prowess of Masks, elite soldiers ruthlessly trained at the Blackcliff Military Academy, whose faces come to fuse with the metal masks that mark their station. But now that the current Emperor is heirless, the mysterious Augurs have decreed that a new Emperor is to be chosen from among the Masks at the Academy, through a series of Trials. Against this backdrop, Laia, a Scholar girl, loses what's left of her family to the Masks, and she must work with the Resistance to rescue her brother from an Empire prison; meanwhile Elias, a Mask of high standing, seeks to escape the Academy for a kinder, easier life, but learns that the Augurs have other plans for him. Their perspectives alternate and their paths cross, irrevocably changing both. As the above paragraph shows, this is a debut of the sort that Relies on Capital Letters to convey its world-building: the world is little more than a Scaffolding made of Concepts that allows Tahir to explore her main characters and the dynamics between them. But she does this to genuinely good effect: the threat levels are high and sharp, the characters are engaging, and the relationships between them occupy the bristling center of the sparsely decorated stage. Laia's journey from frightened runaway to capable spy is compelling, while Elias' struggle to maintain his integrity in a shockingly hostile environment is appropriately tense. The villains, in particular, are frighteningly effective, the Academy Commandant's casual-seeming cruelties foremost among them: Tahir renders violence extremely well, and the physical and psychological effects of that violence are believable and lasting. I also enjoyed watching the world's magic grow from a whisper to a scream, laying the groundwork for future developments. Essentially, even though the setting feels more built from analogues than originality, a little suggestion goes a long way, and the result is frequently riveting. I'm always delighted to see books where women talk to each other and form friendships with each other — something that you wouldn't think is rare until you start looking for it — and there was just enough of that in this to really whet my appetite for more. I appreciated seeing many different women — kind, surly, loyal, treacherous — in many different roles, but was a little saddened to see how much of that was overshadowed by a constantly shifting landscape of sexual desire and threat. Indeed, if there is a flaw where the character work is concerned, it's in the romantic tension, which isn't a love triangle so much as a love-"N." This would be fine if the characters' desires didn't sometimes seem to flip-flop in accordance with plot contrivance more than their own development. While this, too, was engaging in a soapy sort of way, it made a number of high-stakes turns seem a bit facile.